Matt Kemp was an unlikely guardian for Freddie Freeman. At the time of his trade to Atlanta, the veteran outfielder owned a .285 on-base percentage and an OPS+ hovering around league average. Still, his 23 home runs in San Diego provided an obvious right-handed power threat and on Aug. 2, when he arrived in Atlanta before the series opener against Pittsburgh, Kemp relayed that Freeman greeted him with a hug and said, "I finally have someone to hit behind me." It’s difficult to dispute the subsequent output. In the month of August, Freeman has indeed been one of baseball’s most potent hitters, vaulting back into pre-rebuild levels of productivity. Even before Sunday’s 3 for 4 day in his own personal bandbox that is Nationals Park, the 26-year-old first baseman was hitting .293/.464/.756 with five home runs in 12 August games. And since the Kemp era is a microscopic sample size at this point, Freeman can only be taken at his word. Something has clicked. The bigger picture for Freeman’s up-and-down campaign, a self-described "roller-coasty" season, is that this recent outburst has reestablished him as one of the National League’s tougher outs — and, at least momentarily, halted a trend that’s followed him since signing a franchise-record contract in February 2014. Before the start of this month, Freeman’s offensive numbers, based on weighted runs created plus (wRC+) were on a three-year decline as his annual salary continued to escalate. His electric first half of August has him producing back at 2014 levels, when he was protected in the lineup by the likes of Justin Upton, Evan Gattis and Jason Heyward. Freeman’s production has been difficult to gauge over the past two seasons due to injuries and his role as the only true threat in baseball’s lowest-scoring lineup, but his rebound from a slow start is an encouraging sign for the Braves with SunTrust Park right around the corner. Given his rising salary and a lack of difference-making position players, Atlanta needs Freddie Freeman at his best if the 2017 season holds dramatic improvement. If his August tear offers any clues, he’s still capable of haunting opposing pitchers. Through the first two months of his big-league career, Mauricio Cabrera’s longstanding statistical complication has yet to cause concern. The 22-year-old reliever remains in control … to a surprising degree. Consider, for instance, his past six outings: Cabrera has not allowed a single walk in the month of August while more than 70 percent of his pitches have produced strikes. He’s allowed just two earned runs over that span — a low-leverage stint with Atlanta already holding a 7-3 lead over St. Louis. In total, his walk rate (2.38 batters per nine innings) ranks top-20 among MLB rookies with at least 20 innings pitched. His 2.78 ERA, 2.30 fielding-independent pitching and 0.6 WAR also rank among the sport’s best first-year bullpen pieces. It wasn’t supposed to be quite like this for a right-hander who walked more than five batters per nine innings since a 2014 stint in rookie ball — that number nearly reached six free passes per nine at Double-A Mississippi this season — but one trend did follow Cabrera to Atlanta. Throughout his minor-league career, despite earning command-related red flags, he consistently avoided making major mistakes that ended up in the outfield seats. In more than 55 combined innings this season, he has yet to allow a single home run. If he makes it to Friday without giving up a long ball, Cabrera will have gone a full calendar year of keeping baseballs inside the confines of various ballparks. Top relievers are typically home run-averse. Since the start of the 2013 season, MLB’s lowest home run rates among qualified relievers belong to All-Stars Wade Davis and Mark Melancon. Joining those two high-profile names in MLB’s top-30 are standouts Aroldis Chapman, Greg Holland, Trevor Rosenthal and Zach Britton. Just outside that list sits Yankees and Red Sox stars Dellin Betances and Craig Kimbrel. Cabrera could someday find himself in such company. It’s too early to gauge. The early results, though, point to the type of sustainable success that a 100-mph fastball does not always guarantee. 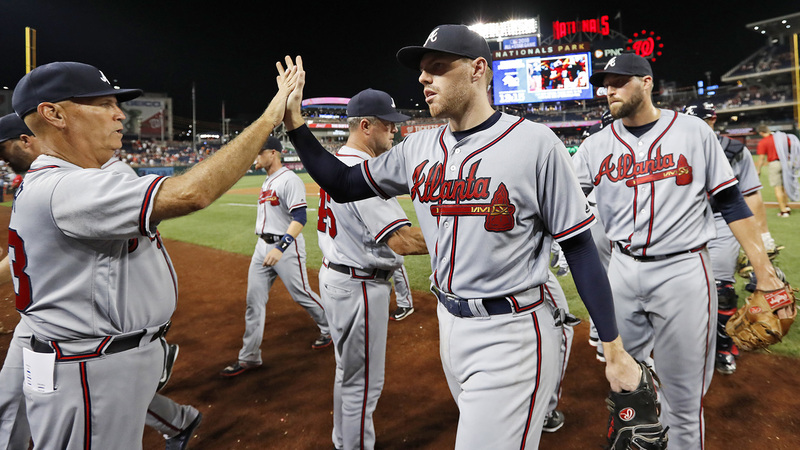 The Braves are in the middle of arguably their best month since their extensive rebuild began. After logging series wins against the Pirates and Cardinals and splitting a four-game set with the Brewers, Atlanta snapped a longstanding losing streak at Nationals Park this weekend. However, much of that success has been propped up by a resurgent offense and stingy bullpen. The starting rotation — operating without a single Opening Day starter at the moment — is a different story. There have been flashes of long-term potential from the likes of Tyrell Jenkins, but after another rough outing on Sunday the staff’s August ERA now sits at 5.96, the ninth-worst in baseball. Help is on the way. Teheran made his first rehab start with Triple-A Gwinnett on Sunday, allowing one earned run in five innings. Meanwhile, Wisler has put up solid numbers in three International League starts, owning a 3.66 ERA with 18 strikeouts and five walks. Teheran is expected to rejoin the team by Friday, but, as long as the organization believes he’s made the necessary corrections, it might be time to throw Wisler’s name back into the mix. Think Julio Teheran is ready to be back with the #Braves? The parent club’s starters could use some relief.